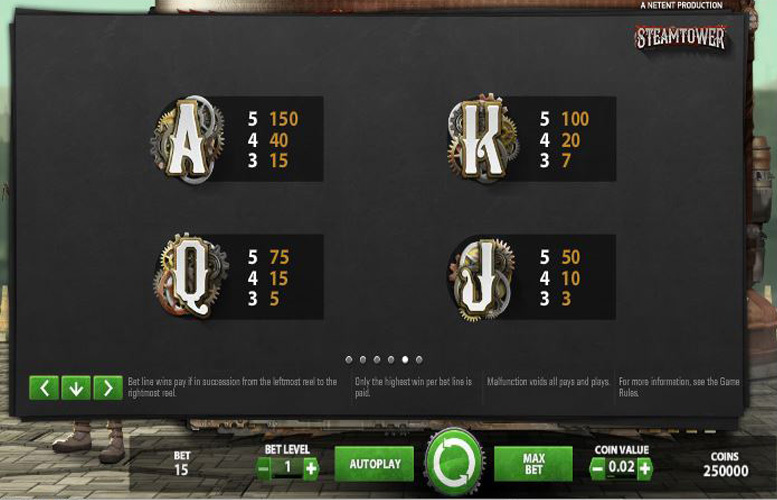 Steam Tower is a five reel and three row slot with 15 pre-set paylines and a theoretical return to player percentage of 97%. 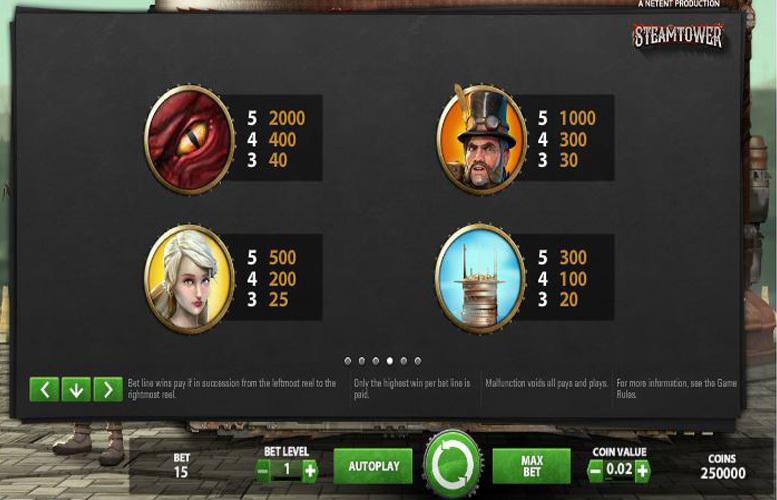 Taking a steam punk theme, the game gives players control over their bet level and coin value, and also introduces Stacked Wilds and free spins with an increasing multiplier to boost player’s chances of winning big. Set within a fictional steam punk tower, Steam Tower is a slot with a unique theme and interesting features. Our full review will take a closer look at the game and will particularly focus upon its top jackpot, special symbols, paytable and betting limits. Steam Tower is a slot which gives players a number of different ways to boost their overall winnings, but the way to achieve the top jackpot is by seeing the game’s most valuable symbol combination line up along all 15 paylines. The game’s most valuable symbol is the dragon’s eye symbol and a combination of five of these across a payline pays at a rate of 2000 times the bet level. At the maximum bet level of ten, then, that results in a payline jackpot of 20,000 coins and if the combination covers all 15 paylines the top overall jackpot of 300,000 coins is achieved. If a player were lucky enough to win that jackpot and to do so at the top coin value of £1, therefore, the currency value of their winnings would be an impressive £300,000. There are actually only two special symbols involved in the gameplay of Steam Tower and both of these are wild symbols. Wild Symbol – the game’s traditional wild can appear anywhere on the reels during the main game and free spins, and will substitute for all other symbols to make up the most valuable possible combination on any payline. 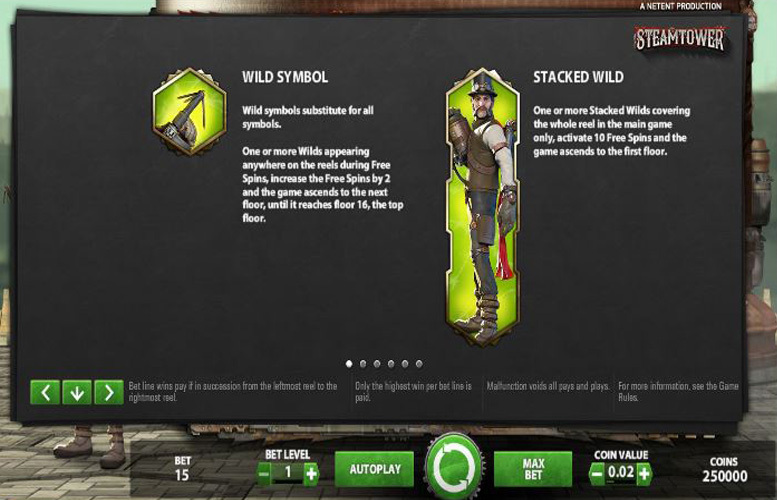 Stacked Wild Symbol – stacked Wilds, meanwhile, can also appear anywhere and if one or more cover an entire reel in the main game, ten free spins are triggered. These free spins take place at the same bet level and coin value as the spin which activated them, are played within the game’s tower and the first spin always takes place on the first floor. All wins within free spins are subject to a multiplier and that multiplier increases with each floor the player rises to in the tower. A player ascends the tower by one floor each time one or more wild symbol appears after a free spin, and the appearance of one or more wild also adds an additional two free spins. The multiplier begins at x2 and can rise to a maximum of x7 at the game’s highest 16th floor. If a player does reach that top floor, they also receive a bonus win worth 1000 times their current bet level. As has been demonstrated above, there are many ways for Steam Tower players to boost their potential winnings. The most common jackpots within the game, however, remain those won by lining up five symbol combinations along paylines in the main game. The most valuable such combination is that made up of five of the dragon’s eye symbols and that pays out at a rate of 2000 times the bet level. That results in a payline win of 20,000 coins if the maximum bet level of ten is selected and the overall top jackpot of 300,000 coins if the combination appears on all 15 paylines at once. After that symbol combination, the next most valuable is one displaying five of the steam punk man symbols. That particular combination pays at a rate of 1000 times the bet level and so can result in a top payline jackpot of 10,000 coins and a maximum overall payout of 150,000 coins. Steam Tower’s 15 pre-set paylines are all always active but players can determine how much they bet per spin by setting both the bet level and coin value for each spin. There are seven different coin values between 1p and £1 and ten separate bet levels from 1-10 which determine how many coins are bet per payline. A player can therefore bet a minimum possible stake of 15p if they select bet level one and a coin value of 1p and can bet a maximum possible stake of £150 if they choose bet level ten and a coin value of £1. 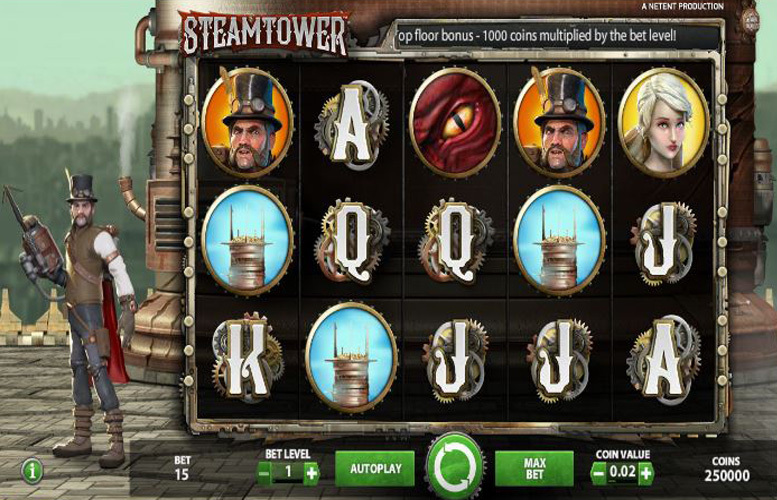 With an interesting and innovative theme and fun symbols, Steam Tower is an attractive slot game option. What’s more, the slot also provides really generous potential jackpots and a fun free spins setup to add to the enjoyment. Those jackpots can be worth up to a maximum of £300,000, which is comparatively very generous and makes the slot potentially one of the highest paying around. The free spins format, which introduces a tower based multiplier, also adds some extra interest and fun to the equation whilst helping to further improve a player’s winning potential. Outside of those free spins, however, the game does not offer any other additional features or bonuses and that may put some players off. This game has a rating of 4 / 5 with 788 total reviews by the users.